Imagine a world without childhood brain tumors. That's the future we're fighting for. The reality, though, is that 13 children and teens are diagnosed each day with a brain tumor, more children die of brain tumors than any other cancer, and survivors often face lifelong side effects and years of tests and treatments. 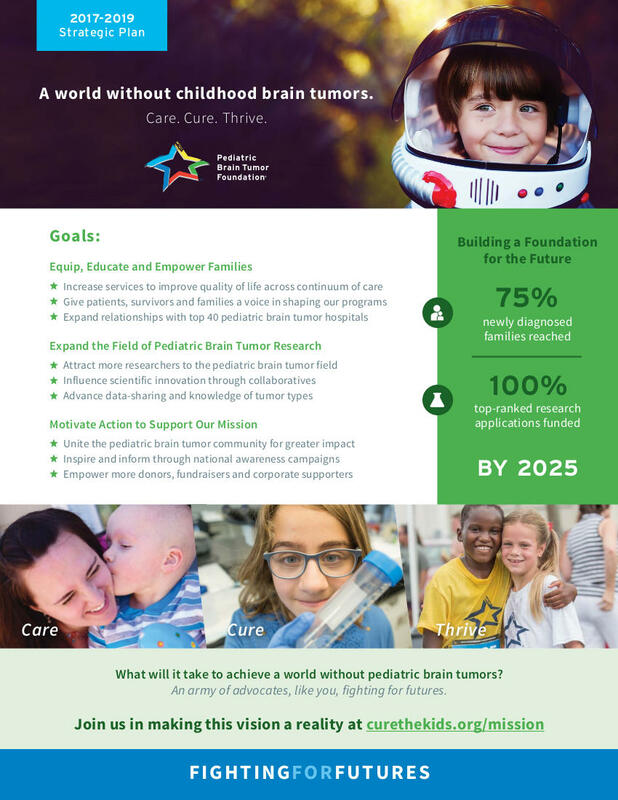 As the world's leading nonprofit dedicated to children and teens with brain tumors, the Pediatric Brain Tumor Foundation’s mission is to care for families along their journey, cure all childhood brain tumors, and help survivors and families thrive. No family should have to face their child’s brain tumor diagnosis alone. Through the PBTF's family support programs, resources and events, we equip, educate and empower families. All services are free for pediatric brain tumor families, including emergency financial assistance, a practical toolkit for newly diagnosed families, brain tumor family camps and bereavement support. Get help for your family. The PBTF's research portfolio is paving the way for better treatments, increased survivorship and a higher quality of life for children and teens. Our Research Advisory Network, comprised of the top childhood brain tumor experts, helps strategically shape our research funding program for maximum impact. Learn about our research funding. Children and teens with brain tumors are the PBTF’s Stars, and we’re committed to helping these Stars shine. By uniting the pediatric brain tumor community around our shared mission, we can fight for the future every Star deserves – one free of physical, intellectual and psychological effects and recurrence. Join us in fighting for futures. Achieving our mission demands an aggressive strategy. The PBTF's Strategic Plan outlines our 2017-2019 roadmap, with objectives looking ahead to 2025. You’ll find an overview of this plan below to see what steps we’re taking today to put an end to pediatric brain tumors tomorrow.